As his playing days in the Colorado Springs Symphony came to an end, Ashland College's music faculty director Calvin Y. Rogers laid down his bow with a flourish and gifted his beloved Poggi violin to a charitable remainder trust benefiting the University in Ashland, Ohio. Poggi violins are considered to be the premier Italian violins made in the twentieth century, and are in high demand from those who truly treasure fine string instruments. 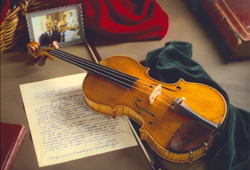 A personal visit to, and pictures with, the violin maker himself, along with a letter of authentication, added emotional and real value to the instrument, which was made in 1935. Professor Rogers and his wife, Helen, felt that giving the violin in this manner was a fitting tribute to their long association with Ashland University. The gift creates an endowed fund to support scholarships in music.